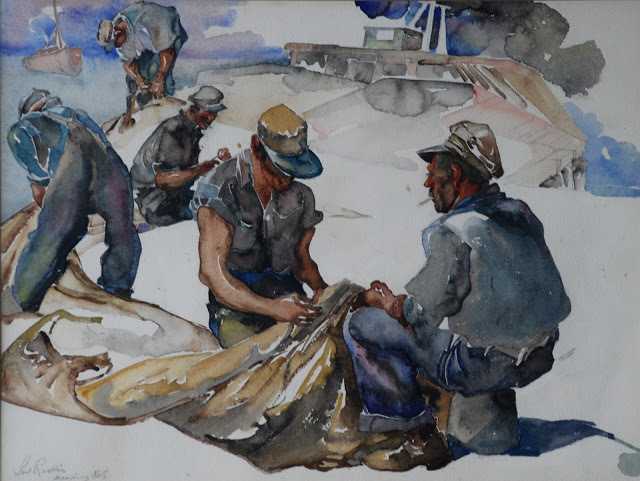 Saul Raskin (1878-1966) watercolor titled Mending Nets. 1935. Raskin made an etching based on this subject in 1945. Framed, 16 x 20″ sight. p.o. r.
Raskin was a member of the American Watercolor Society*, the Society of American Etchers*, the Audubon Artists* and the New York Watercolor Club*. Raskin married Rae Malis. They had at least one son, Eugene Raskin. Raskin’s wife Rae also wrote for a number of publications such as the mass circulation Yiddish daily nationalist-Zionist newspaper Der tog in the late 1910s and the nonpartisan Froyen zhurnal (The Jewish Women’s Home Journal) in the early 1920s. She also wrote articles about Federal and State governments and the setting up and organization of a woman’s club. Raskin died in New York in 1966. The Yeshiva University in New York maintain a collection of cards, newspaper clippings, correspondence, and publicity forms covering the period 1960 – 1966.